Meeting for initial briefing of the trip. 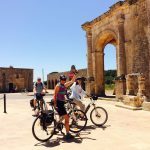 On our first cycling tour we will visit a traditional craftsman fabric workshop, a few pre-historical monuments spread across the area, a marvelous botanical garden in Giuggianello, with a unique collection of Cactaceae, and to conclude the tour, a “Masseria”, (a historic fortified farmhouse that produces cheese) in Uggiano la Chiesa. This day is dedicated to one of the most fascinating portions of the Italian coast, where different towers of the XVI century, rise facing the sea. It is the most eastern spot of the peninsula; when the sky is clear you can see the mountains of Albania and Greece across the bay. 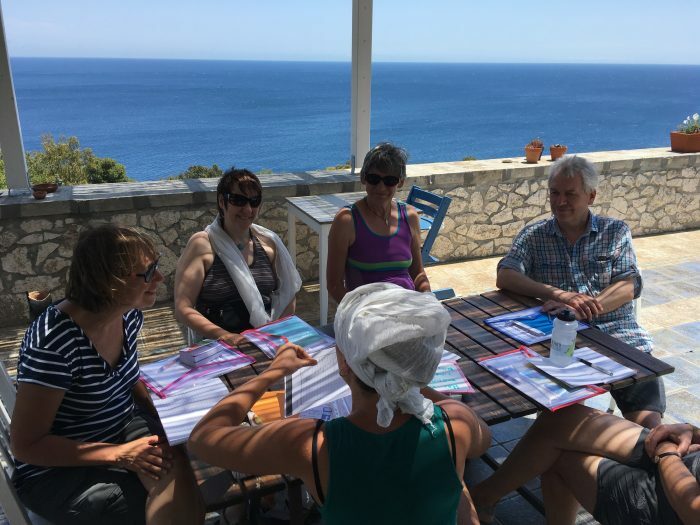 In the afternoon we will visit the Grotta Zinzulusa, a cave proceeding for metres and metres towards the heart of the earth, and the splendid Aquaviva creek, characterised by the underground fresh water river that flows towards the sea. 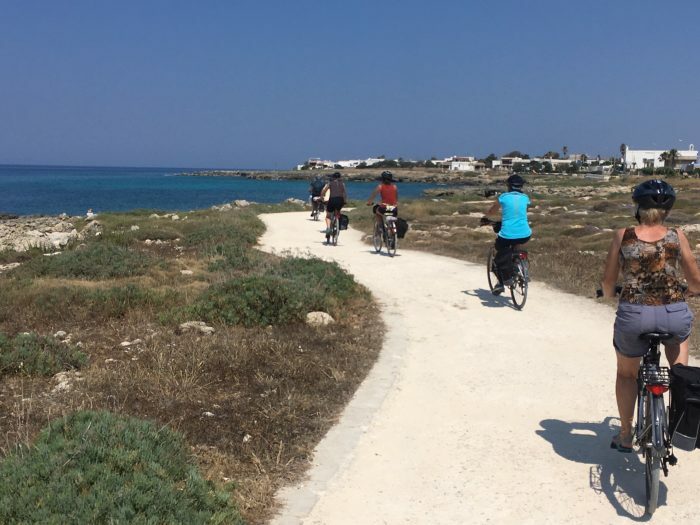 We cycle along Otranto-Leuca coast, the so called “park-road”, with an stunning panorama. 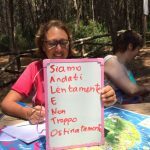 At the arrival in Marina Serra, an Italian lesson will take place in a coastline pine forest, and then we will rest by a picturesque inlet where it will be possible to take a bath. 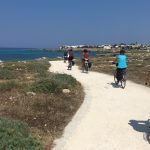 In the afternoon we will visit the small town of Tricase, famous for its churches and small lanes, then we will proceed towards Leuca, following secondary roads characterized by their century-old olive trees. 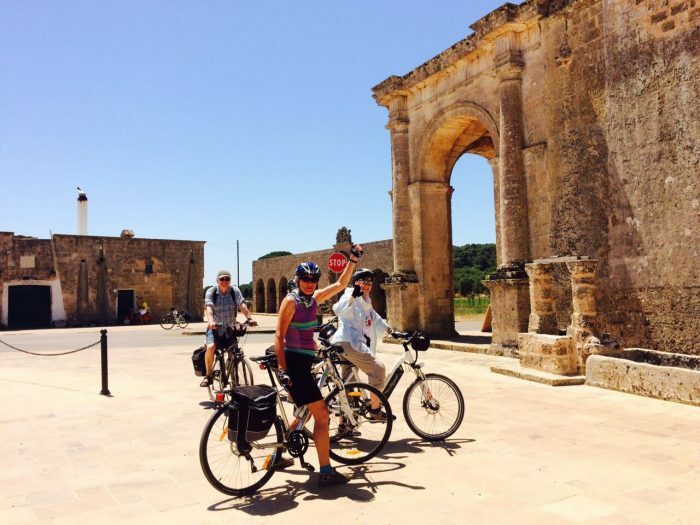 8.30/13.00: Itinerating Italian lesson cycling around villages in the area. 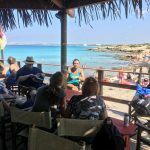 13.30/19.30: Sailing trip, lunch served on board, and a swim in the sea. 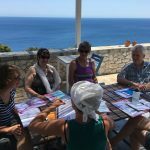 Today will be jam-packed; with an Italian lesson while you cycle across the villages around Capo Leuca. 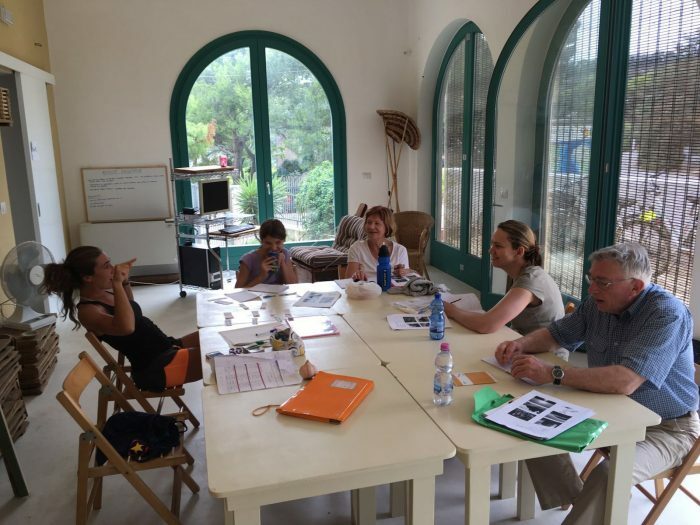 We will see ancient towers, underground oil mills, the ruin of a pre-Roman city, a Mausoleum that holds traces of Byzantinian frescoes, a semi-abandoned castle and an ancient church with incredibly vast sub terrains…; all while having a continuous Italian lesson with our teachers! In the afternoon, we will have a sailing trip with lunch provided on board! 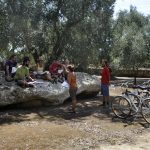 8.30/10.30: Departure from Leuca and arrival at the Sarruni Guest Farm. 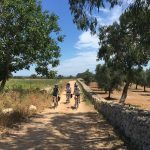 The day is dedicated to the Salentinian countryside, one of the best-kept secrets of the region defined by its olive trees and the Mediterranean vegetation. 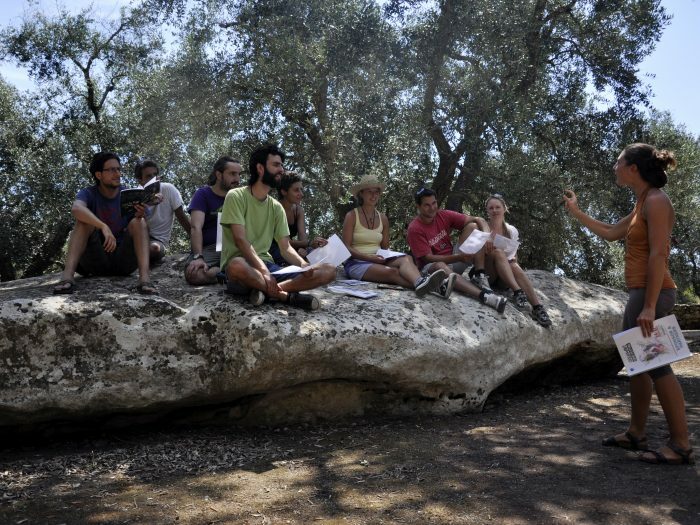 The Italian lesson will take place in the wood of an organic guest farm, where we are going to have lunch. 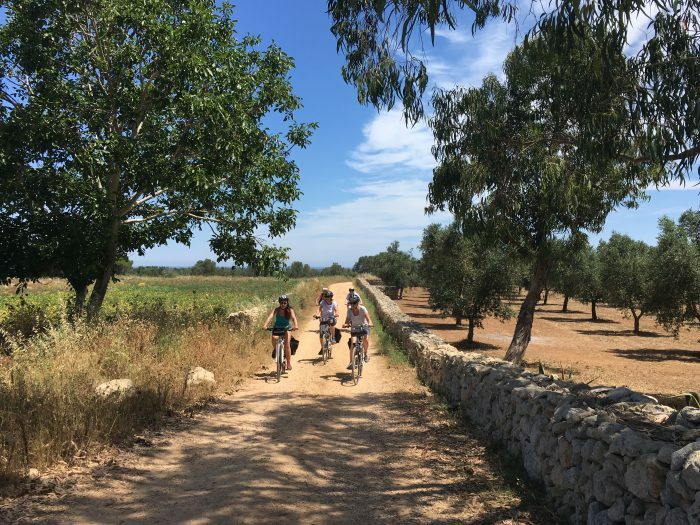 In the afternoon, after the second lesson, we will depart once again across the countryside, where we will see the “Trulli” and the “Pajare” (ancient buildings made with dry stone) and the Tu’rat garden, of Arabian origin. 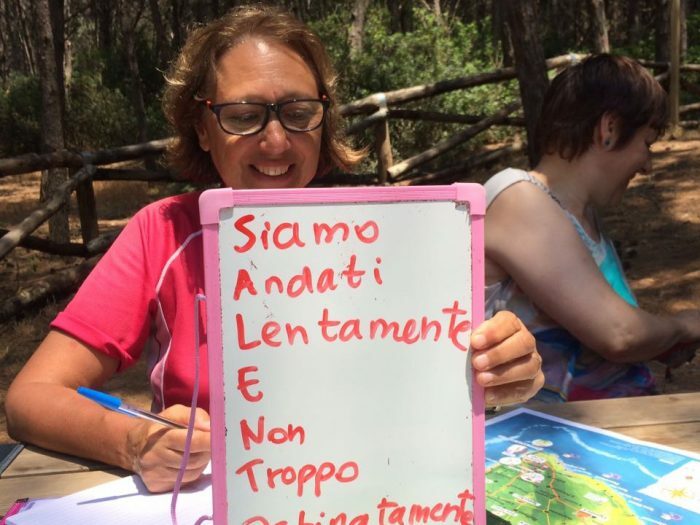 The Italian lesson will take place in a coastline pine forest, next to one of the most famous beaches of Italy. After lunch we will visit Gallipoli, an ancient city from the Roman era on an island, which is currently populated by fisherman. Towards sunset we will travel to Santa Caterina, where we will stop for the night in a B&B with sea view. Another full day today! 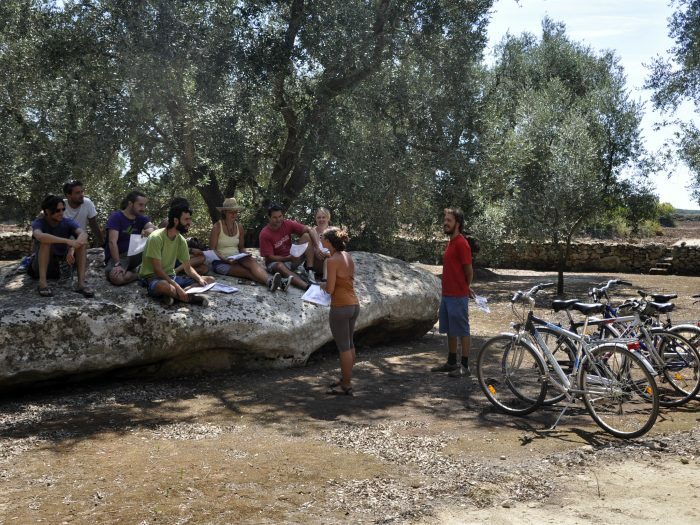 In the morning a short cycle: we will visit the city of Nardó and some of the nearby “masserie”. Then we will go back to our B&B for the Italian lesson. 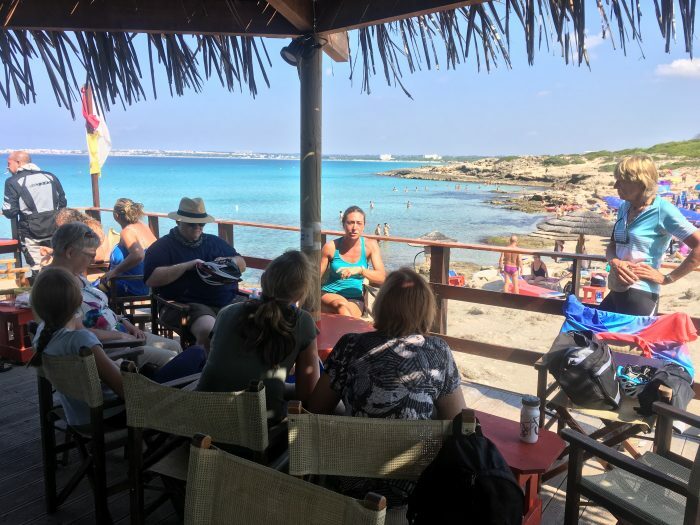 In the early afternoon we will go (on foot or by canoe) to the natural park of Porto Selvaggio where we are going to have our second lesson of the day and then a nice swim. Return by sunset. Morning dedicated to the final test of our Italian course. 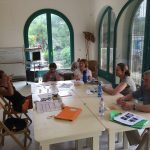 After lunch we will travel towards Galatone, where we will visit the historical centre of the town and the town castle, and then Galatina with its church of Santa Caterina D’Alessandria, one of the most beautiful masterpieces of medieval art in the south of Europe. We will visit a local wine cellar, to observe the process of winemaking, ending with a wine and cheese tasting. In the late afternoon we will get the train for Lecce and we will reach the city in the evening.